Roti by another name...this is indeed a simple recipe. I hope you can post the chicken recipe too so we can get a taste of the meal. How wholesome and 'green' we used to be...all ancient people were! And now,we are trying to go back a little - how much ever modern lifestyles will permit. Very informative post! Very intriguing!! 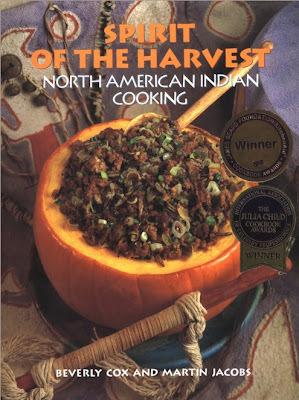 Now you got me hooked to Native American cooking with this post of yours! And i am totally gonna' try this one! Once again, its heart warming to see the similarity between cultures: like Anita said, the ute tortillas remind me of roti! Love this "Ancient Cuisines" series of yours (i hope it does become a series) :-D.
Almost like a roti, except that it has baking powder in it. Baking powder, I am sure, is a new ingredient. So until the time that it was incorporated into the dish, it was very much like our roti. I liked the idea of rubbing the dough with oil. My roti ka atta goes dry on the outside even if I cover it with a damp paper towel. The oil kept the dough moist! 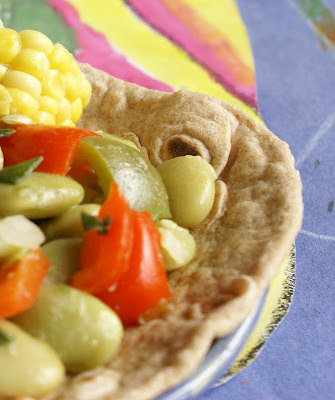 Succotash is coming! Hold your horses! The recipe I followed as well as the other succotash recipe has no cream in it. I haven't looked it up further so I don't know if that is an adaptation for the Western kitchen or if there were some tribes that did that. If any of you find out, please let me know! Musy, I'm hoping it will be, too! It's been quite an adventure. Although the Persian cuisine has taken a back seat! And that is mainly NaBloWriMo's fault! 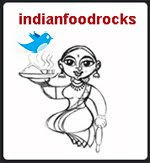 Mythili, it's simple cooking. Lots of stewing and a lot of frying, too. I stayed true to the flavors and didn't add any chillies or any other spices or seasonings. Funny that I didn't pay attention to this question, bcoz it is everywhere around me. Not that I get tired, but thank you for turning my focus. I should visit the library. Wow!! another master piece, never given a second thought about these ancient cuisines, lovely read!!! and hey quite a nice dish!!! Wonderful post...I love the hearty cuisines of yore...something so warm and inviting about them...if only we could bring back even an iota of that lifestyle into our's. The unbleached flour in the dough makes it shrink. I bought a tortilla press couple of years ago, but never used it for making tortillas yet! I use it for rice flour rotis. Works well with rice flour. I will try tortillas some day. This answers my question about fry breads. I might try it too if I get time. Manisha, congratulations on your well deserved "Click" win :) I loved this post... wonderful info and I hope this becomes a series too! hone ground corn or wheat has a really earthy taste and aroma and i can imagine how wonderful it would taste the way they made it. do visit the ute museum at monstrose if yo go to black canyon of the gunnison.